Such an attitude is better called and categorized as “the cosmic optimism”. It consists in recognizing and identifying oneself with the primary energy that created everything. The creative attitude gives us an advantage because it gives the possibility to contact the source of our own being, along with the unlimited capacity of spiritual evolving. The creative attitude is itself a part of the evolution process. The worldly, physical boundaries can be easily overcomed by approaching such a creative attitude and by applying it with wisdom. Foe example, in the same way there have been notable successes in commerce. The ones involved in this kind of activity can mobilize so that they imagine they are full of beneficial, attractive energy. It makes an unbeatable barrier for doubts and negative emotions. Brahma is the name of the creative aspect (face) of the Divine. His symbol is the golden egg or the aura. In Tantric cosmology Brahma represents the embodiment of the entire creation. Because he governs all destinies and things in the world it is very important and necessary for you to “become Brahma” or that “Brahma to be in your favour”. Eastern teachings say that you can become a certain thing by identifying with it. Thus, by identification, the power of creativity is in your hand at any time. By seeing the identity between your own being and creation there is a new conscience that radiates from the “centre” of the Golden Egg. An efficient technique of identification with Brahma and with the universal creative energy is that of imagining and visualizing yourself as surrounded by an aura in the shape of an egg, shining, golden-yellow or by an aura full of positive energy; imagine how bright rays, full of warmth and force go from this aura and spread around lightning and feeding the life. The senses are Creativity’s instruments. Their origin is in the inner subtle Brahma’s domain. They have their manifestations in the physical reality and you know them as the organ of senses: the eyes, the nose, the mouth, the ears and the skin. Esoteric tradition considers the mind to be the instrument of a sixth sense. Saraswati is the name that Hindi people gave to the feminine counterpart of Brahma. 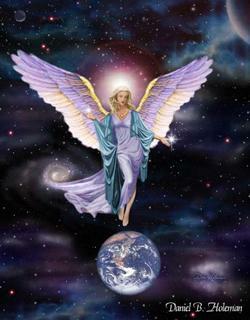 She is seen as “The Master of the 64 Arts” from which the art of loving is considered as first and the most important. 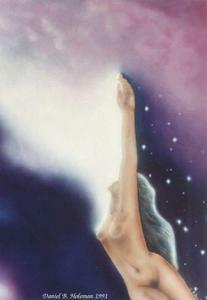 The feminine energy or the Shakti represents the Creator’s power. Saraswati’s Symbol is an Indian musical instrument with seven strings known as Vina. The shape of this instrument makes you think of a woman’s body and the sound that it produces is just like a wonderful voice. 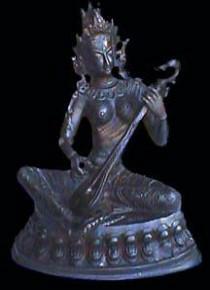 Vina represents the “senses’ instrument”, Brahma’s pleasure. By playing this instrument Saraswati expresses her joy that no one has ever seen before. The seven strings of Saraswati’s instrument symbolize Nature structured in its evolution: the seven rays of creation, or the natural order of the transformations that we see all around us. This identification supposes that there is a specific, abstract meditation and an interior special power. By becoming “Brahma and Saraswati” the Tantric couple will be able to evoke the archetype that created them and that defines them.